TIME'S UP! and other groups are spreading the word to ride together. By riding with your friend or buddy, it immediately becomes safer. By teaming up with a third person, it becomes even safer. Ride to work together and ride home together. When you see another rider, be friendly and link up. Ride to the beach together! 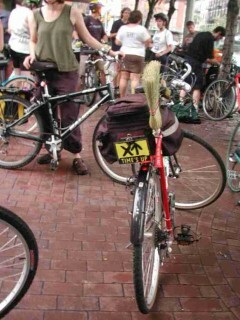 Group rides create community, and with it, demand for positive change. Whether it's a moonlight ride, a Critical Mass, or just linking up with a buddy, these clusters of bicycles will eventually create safer conditions, which will attract new riders, thereby increasing cycling and pushing cities to create positive infrastructure for cycling and their community. End result: more communication, more connection, less pollution, less stress, better bike parking, and more parks and greenways. Oh yeah, we forgot to mention: you'll be in a lot better shape. TIME'S UP! organizes a number of rides. Generally someone had an idea for a ride, got together with others, and made it happen. Some are a little more involved, working with environmental, community garden, and youth groups. Our regular group rides and other events are listed below. So now you have the solution to make your city safer for bikes. It's simple: create more bike rides! This Friday night, instead of going to a bar with corporate values, organize a bike ride into the fresh outdoors. Find a local park, bring some lemonade, do a couple of loops. You'll find this ride is great for beginners because it's in a park, which usually has less traffic volume and will attract new riders. Other weekend rides, such as beach rides and trips out of town, are also easy to organize. The key is to make a lot of flyers, get a couple of ride leaders, and you can even start making a calendar of events. It's easy to get listings in local papers. 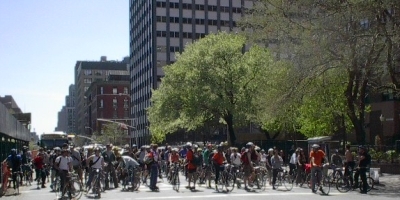 Critical Mass, a bicycling event that takes place in over 200 cities in North America, is also a great way to promote cycling and get new people riding.